Twenty assorted 5 x 7" blank notecards (5 each of 4 styles) with white envelopes in a decorative box. Born in Columbus, Ohio, George Wesley Bellows (1882–1925) enrolled in 1904 in the New York School of Art, where he elected to study not with the popular William Merritt Chase but instead with the unorthodox realist Robert Henri. Henri led a radical group of artists, including John Sloan and William Glackens, who exhibited under the name “The Eight”; their subjects were considered crude and at times even vulgar. Bellows never became an official member of The Eight, but his paintings of gritty New York street scenes and prizefights were subjects typical of the group. 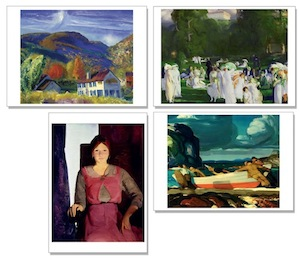 As evidenced in this notecard collection, Bellows did not limit his canvases to any one theme. He captured the serene side of life in exquisite portraits and beautiful land- and seascapes. He enjoyed enormous popular success during his short lifetime and remains one of the most highly regarded American artists of the early twentieth century.